Marble floor in need of restoration! 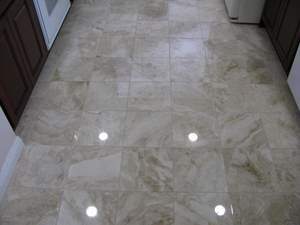 Marble floor restoration is a common process for marble that has lost its luster or experienced other problems on the surface of the stone. Diamond abrasives were used to completely restore this kitchen’s marble floor and bring it back up it back to its full clarity and shine. 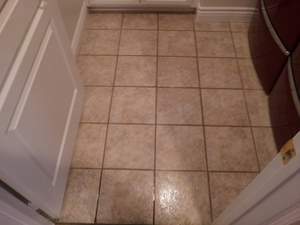 This floor is beautiful! Marble floor is dull! 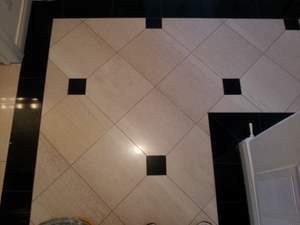 There are a few steps that will help this beautiful marble floor its life back. First, the floor was honed with diamond abrasive pads in order to even our the surface. 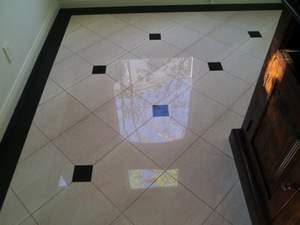 Next, the marble floor must be polished to insure it receives it shine and luster. These are key steps in bring life back to marble. Sealing was the last thing this floor needed. 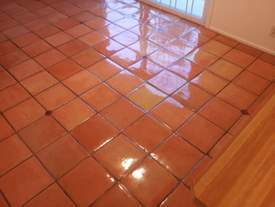 Sealing will help this floor keep its luster much longer. This floor is shiny and lively now! Dull Saltillo Pavers need a full restoration! 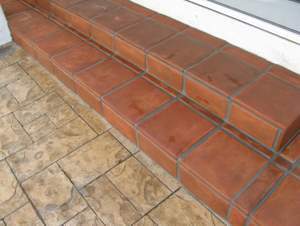 These pavers were stripped down to the clay with a solvent-based stripper to prepare for a new start. 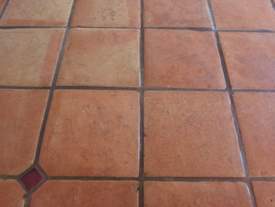 Paver restoration is a process that includes the stripping, cleaning, and sealing of many types of paver floors. 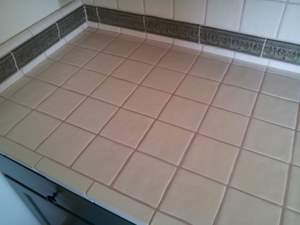 Each tile is hand-stripped to assure extra care when handling this fragile tile. Sealing is the last step in the paver restoration process, giving this floor the strength to last. This floor looks flawless! Dirty travertine needs cleaned! 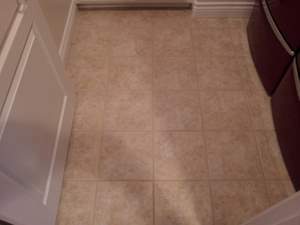 Dirt trapped in holes and grout lines leave travertine looking dirty and worn. 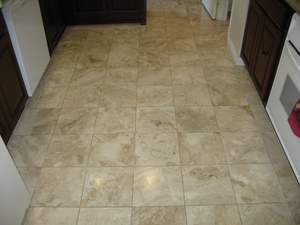 A proper clean and seal is what this travertine stone floor needed to get its luster back. 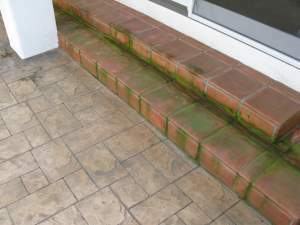 Pressure washing brings dirt up and out of travertine tiles and grout lines leaving it looking like new. After the floor is clean a sealant is applied. Sealing stone protects the surface of the stone for a longer period time, making it hard for dirt and grime to seep into the stone surface. This floor looks brand new again! Granite counter needs help! 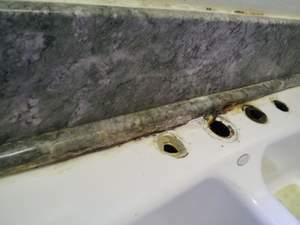 This granite counter top has been damaged due to the rusting of the iron rodding under the stone. 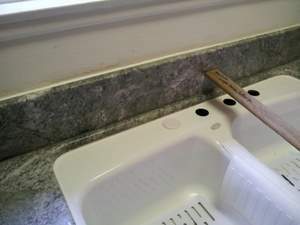 A piece of the granite was removed in order to replace and repair this counter top. 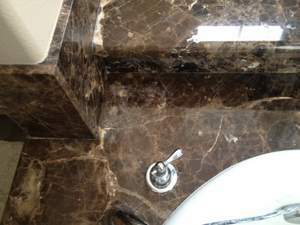 Granite fabrication involves polishing the stone with diamond abrasives for a smooth finish and installing to match the existing counter. This granite counter top is looking good once again! Etched marble needs repair! A shampoo bottle was left in the top, left corner of this marble bath tub leaving a lighter appearance where acid hit. Etching occurs when an acidic product is left on the surface of a stone and slowly reacts with the calcium carbonate, eating away at the marble. This marble bath needed to be diamond honed and polished in order to bring the stone back to life. It is like the etch was never there! 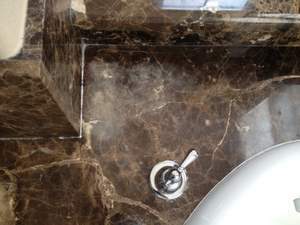 This marble bath has luster once again! 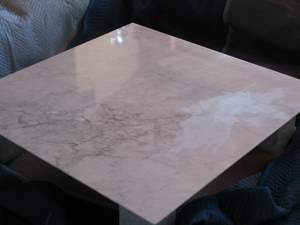 Etched Marble table needs TLC! Etching is caused by acidic products coming in direct contact with stone. 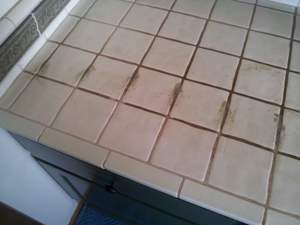 Orange juice, coffee, cleaning products and many other household items can cause such etching. 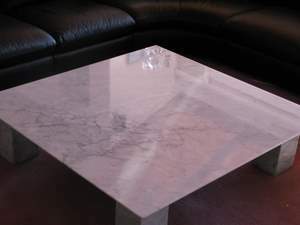 This marble table was honed, cleaned, and polished in order to bring it back to a beautiful state. The owners could not tell the etch marks were ever there. Mission accomplished! Stamped Concrete needs some work! 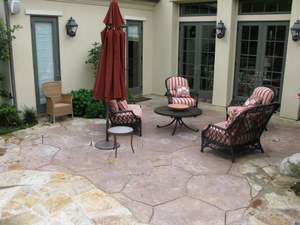 Outdoor concrete can easily lose its luster because of elements like sun and rain. This concrete was stripped with diamond abrasives down to its most natural state before it was cleaned. 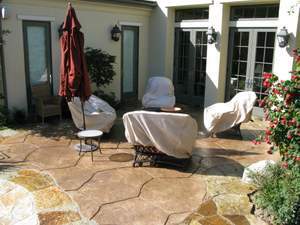 Once stripped and cleaned, the stamped concrete was thoroughly sealed to assure longer protection from nature’s elements. This backyard looks more stunning than ever!